In my makeup bootcamp classes, I'm asked a lot to suggest products, so here are my recommendations (both for expensive and cheaper brands) that I own, use personally and in class, for makeovers, on shoots... Note that (with a few exceptions) I'm mainly speaking of a brand product, rather than a specific shade. This is the first post in a series of five, and covers "base" items (ie Primer, Foundation, Concealer, Powder). It's a good idea to use a primer to give you a flawless base, to help your makeup last longer and apply more easily to your skin. It can smooth-out fine lines and wrinkles, and also provides a barrier between your skin and your makeup. You can always choose one with an SPF if your foundation/moisturiser doesn't contain SPF. I don't tend to recommend cheaper foundations, simply because I haven't found any yet. These are my overall favourites, depending on the type of finish and look I am aiming for. 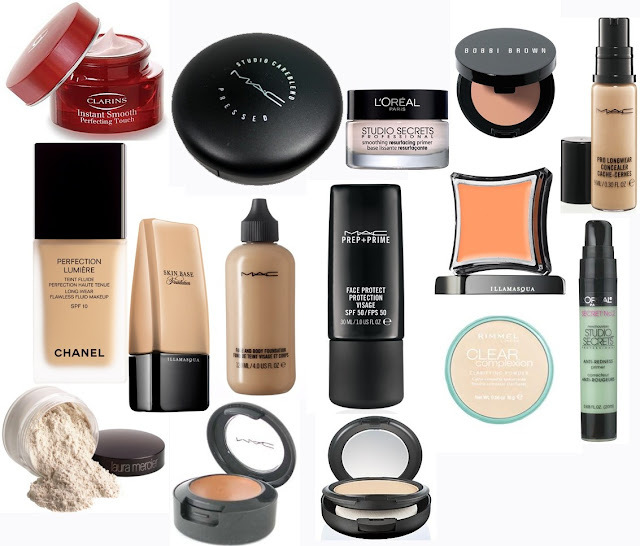 For more information on concealers and correctors, click these blog links (Concealers In General, Concealers - MAC). Finishing powder is an important last step, to make sure you don't look shiny (especially if you're going to be photographed), and/or to make your makeup last longer. There are a lot that can be recommended, but in general I would say go for a translucent powder. HD powders (eg Makeup Forever HD Powder) have to be used very carefully to ensure they're properly buffed-in (to avoid a white "flashback" on the areas of your face you've powdered, in flash photography).